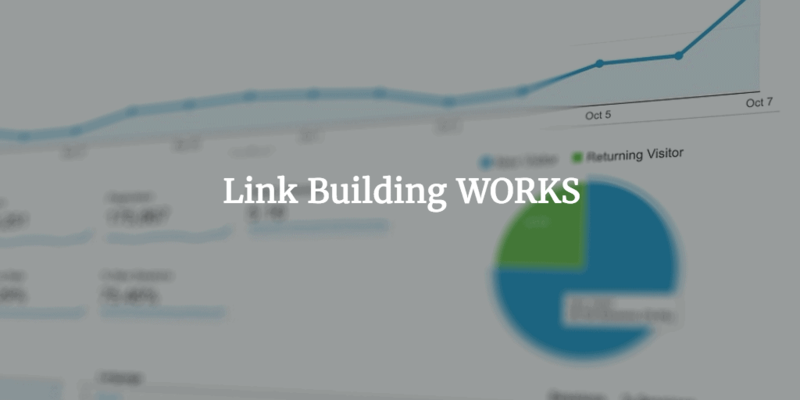 Link building is not dead and it is not going anywhere anytime soon. Even if you’ve published the best content, if Google and other people cannot find it or don’t know that it really exists, you’ll not going see any improvement in rankings. Write awesome content that nobody else had posted. It has to be the best of the best content. Tell people about your great content. This is where you’ll build links along the way naturally. Links are what tell search engines about the existence of your website. There is no other way. When other websites link to your website, search engine crawlers find your website. When a lot of links on different websites point to your website, crawlers will visit your website and will consider it important and of value. Yes, there are other factors too but links are the primary way search engines determine the popularity of a website. This is why sharing your content, reaching out, and telling people about your website and great content is so crucial. This is how they link to your content and your website gets all the love. The number one reason why link building should be your top priority is that backlinks are the most important ranking factor. Ranking without backlinks is nearly impossible no matter how great your content is. Because there is no way search engines will find how helpful and awesome your content is. They might never find your website and will never crawl it. Statistics show that more than 99% of top websites have at least one referring domain pointing to them and the number of unique backlinks from different websites is correlated with higher search engine rankings. There is no way better than backlinks to improve search engine ranking. In order to get the right backlinks, however, you do need to know what you are doing, and some SEO training will certainly come in handy. Luckily, there are many agencies out there who offer training in many aspects of digital marketing – Tillison Consulting, for example. Once you get a hang of the tactic, you can start executing it. Search engines don’t consider all the backlinks equal. Natural links are the ones that are natural. Paid links are never appreciated and these are the links that will make your website look like a spam. So how to build links that Google and other search engines love? This is the best approach to building quality backlinks that will never get your website penalized. Write great content that’s better than your competitors. Reach out to people who have already talked about, linked to, or have shared similar content in the past. Use BuzzSumo to find top performing content and who has shared it. Send them a nice email and tell them about your content. Tell them why it is better and how it can be of help to their audience. Don’t ask for a link. If they like your content, they will share it and will obviously link to it. Outreaching is such a great way to get exposure, build relationships, drive traffic, and to acquire high-quality backlinks from authority websites. The reason why this technique works is that you reach out to the people who are already interested in the similar content. They have already shared or linked to similar content in the past so the probability that they will link to your content (since it is better) is fairly high. It is like using a manual transmission ride and someone shows you the automatic transmission car. You’ll obviously switch to it because it is better and updated. Same goes for the outreaching the right people for your awesome content. This is one of the easiest ways to acquire quality backlinks from authority websites. Follow the steps below to have your post published on an authority blog. Find authority blogs in your niche/industry that accept guest posts. See what type of content they publish. Read a few recent articles and read the guest posting guidelines carefully. Craft a couple nice article titles and a short outline based on the guidelines. Write an email to the editors. Show them your past writing samples and send them the article titles and outline. Ask if they’d be interested in a guest post. Once you get a reply, write the article and send it over. The rule of the game is to send your best content for guest posting. If it is ordinary content, it won’t be accepted. Even if it gets accepted, you’ll only get a backlink and no referral traffic. Instead, write a great article so that you don’t miss referral traffic. This is a similar approach to outreach but in this case, you’ll create an infographic. Infographics have this amazing ability to get shared. They perform better than text. Every single infographic can bring several backlinks at no additional cost. Find a topic that is hot, trending, or is appealing to a wide audience. Search existing infographics. See if you can do any better? If there are no infographics on the topic, that’s your best bet. Collect data and find resources. Create an outline for the infographic. Hire someone on Fiverr or UpWork to create an infographic for you. Publish it on your blog and insert an embed code that allows others to easily copy and paste the infographic on their website. Send a link to your infographic to influencers, webmasters, and all the people who have shared or linked to the similar topic in recent time. Submit your infographic on infographic directory sites like Visual.ly, Infographics Showcase, and others. Sit back and enjoy the backlinks as well as referral traffic. Backlinks are not going anywhere soon. They’re here to stay. As long as backlinks are valued by search engines, you shouldn’t stop building them. This post was written by Hoot a webs design agency in Dublin. They build and re-design websites for growing business all over Ireland.